Monday - Sunday: 09:00am - 21:30. Arrive at the tower an hour before sunset, that way you get to see the city at daylight, during sunset, and dusk. Allow 30 minutes from the enterance to the observatoin deck due to queuing. We are comparing Sydney Tower Eye with Observation Deck Prices from leading ticket suppliers and Try to find you Cheap tickets prices on the market. Entrance into the Sydney Tower Eye and admission to the Observation deck, the tallest point in the city. The tower itself is Sydney's tallest structure and the second tallest observation tower in the Southern Hemisphere. The building was designed by Australian architect Donald Crone and opened to the public in 1981. It stands 1,014 feet above ground level and offers a bird's eye view of the city. The lifts from ground floor take only 40 seconds to propel you up to the observation deck. The observation deck features interactive entertainment including touchscreens and high-powered binoculars to enhance your experience. The tower is one of the most visited tourist attractions in the city and the entrance to which sits inside a shopping mall! Perfect for families and friends. Small children may become restless. 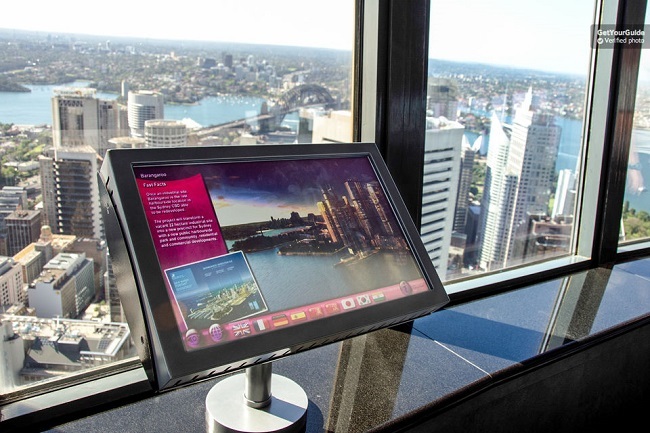 Your Experience With Sydney Tower Eye with Observation Deck? Ride the lift up to Sydney Tower Eye's Observation Deck, located 1,014 feet above ground level. Watch a short 4D cinema production before heading out on the deck. Take in the breathtaking vistas and enjoy 360 degree panoramic views over the city. Dare to walk along the glass floor and watch the city shrink below you! On a clear day, you can see as far as the Blue Mountains! Wander around the circular observation deck spotting Sydney's biggest attractions as you go including the Harbour Bridge, Opera House and Taronga Zoo! What Sydney Tower Eye with Observation Deck Includes? Entrance to the Sydney Tower Eye. Access to the Observation Deck. Admission to a short 4D cinema show. Entrance to the tower is throguh the Westfield Shopping Centre. This is a little confusing at first but follow the signs and you'll be there in no time! Travelers Reviews about Sydney Tower Eye with Observation Deck? The Sydney Tower Eye and Observation Deck has earned over 3345 reviews and a 4-star rating on TripAdvisor. Travellers agree that this activity offered an alternative perspective of the city. Most users claimed the Observation Deck provided a great viewing point though it got rather crowded at peak times (sunset). Tickets booked through Get Your Guide can be cancelled for a full refund 2 days in advance. Tickets booked through Viator can be cancelled for a full refund 7 days in advance. Last entry to the Observation Deck is at 20:30. Sydney Tower, 100 Market St, Sydney NSW 2000, Australia.